And she was perhaps the most beautiful person I’ve ever had the pleasure to know. “My name is Josephine Anderson. Agneta Wright was my Granny. I was in Nova Scotia, looking out over the Atlantic Ocean when I got the phone call that Granny’s time had come. I thought of what it feels like to hug her. I’ve been hugging Granny for as long as I can remember. 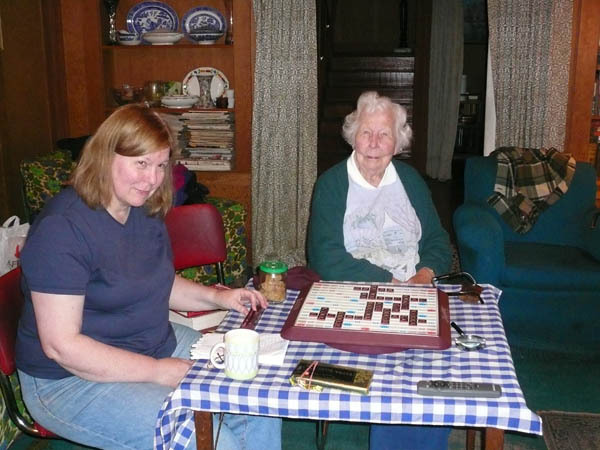 When I was a child, I used to go over to Gran’s place after school. The rule became that the first of us five siblings to call dibs on Granny in the car ride home from school would get to go over. I usually blurted it out the fastest, and I remember visiting Granny as one of my fondest childhood memories. Gran used to tell me that when I was a baby she’d hold me on her shoulder, and I’d fall asleep without a care in the world. I don’t remember this, but I think the feeling stuck, because to this day the most vivid feeling I have about Granny, the thing I miss the most, is nestling into Gran’s neck, giving her a great big hug, breathing in a whiff of her rose water scent, and feeling the best feeling in the world: true, genuine, unconditional love. Granny had an extraordinary life. She lived through WWI and WWII. She contracted and survived the Spanish Flu. She witnessed the change from the telegraph to the cell phone. 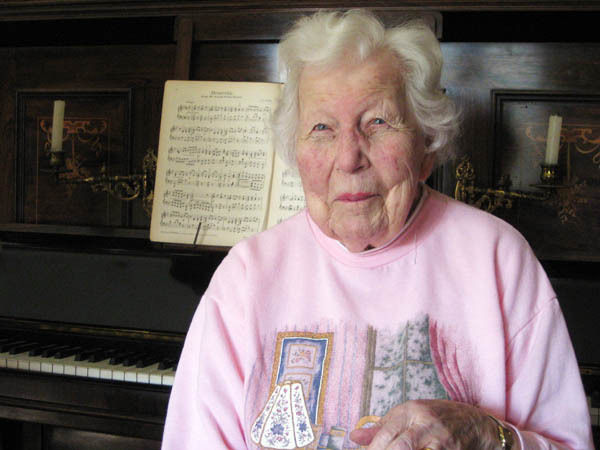 And still, at 99 years old, she had a dimpled, beautiful grin on her face as if she were entirely delighted. And after all these years, after bringing up 7 children, and living in England, Scotland, India, and Canada, and after reading hundreds of books, and crossing paths with thousands upon thousands of people in her lifetime, she still felt charmed by the world, still felt engaged and passionate, still felt full-hearted joy at the tiny details that made up a single day out of nearly 100 years lived. Though I myself have only known Gran as a white haired beauty, she wasn’t always 99 years old. Once, she was a little girl with rosy cheeks and a penchant for getting into mischief with her siblings. She told us about the time her brother Jack convinced her to climb out of their landing window, onto the glass-roof passageway that joined their house with their father’s surgery. They didn’t manage to get away with it though; there was a huge clattering when Jack put his foot through the glass roof. Or the time that she and Jack snuck out of the house for an hour to go to the town gardens and play make-believe in a game called Conquest, sure that no one at home would notice their absence. They didn’t get away with that one either. Or there was the time Gran had had enough of a local boy, a “big lout” who’d been bullying her and her friends. She finally socked him one right in the face and gave him a bloody nose. Turned out the boy’s father was a patient of Granny’s father. Gran remembered her dad bringing it up the next night over dinner, and him chuckling a bit. She got away with that one. Gran ripened well with age. She was tall and slim. She was an actress, a field hockey player, a children’s tutor, and a painter. She met a man named Henry who’d spotted her while she was acting on stage one night, and they soon fell in love. She remembered the time she returned to England from India with a lovely pair of tailored grey trousers, which she knew looked good even if she was the only woman around wearing pants. She was a mother to Peter, Josephine, Cecilia, David, Raymund, Jim, and Rosemary. She managed to cook and care for all seven of them, and even became an impromptu secretary when her eldest son started up his business in their garage. Gran was very proud of her children, and loved to tell stories of when they were young. Like the time Uncle Peter locked her out of her house in Scotland so he could eat the Christmas cake. 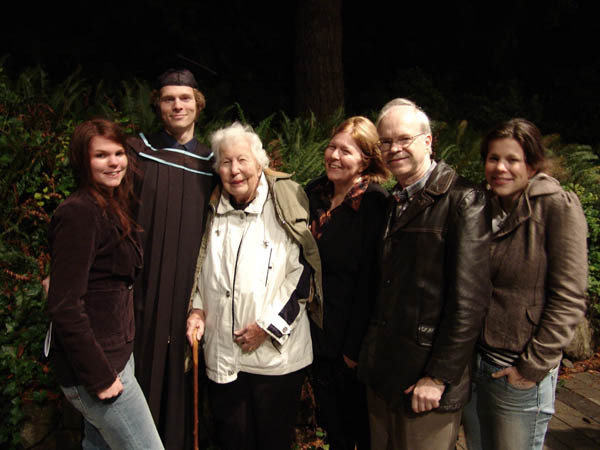 Gran was also very proud of her husband, and his abilities as an engineer, and often recalled to us how, during the war, he helped rebuild the very ship that later brought their family of nine from England to Canada. When Granny was sadly predeceased by her beloved husband Harry and sons Peter and Raymund, she showed the remarkable strength and stoicism she was so well known for. Gran always took care of her family. Up until two weeks before her death, she looked forward to preparing dinner every single Friday night for my mom. And on trips to Bowen, while Uncle David worked hard to take care of the property, Granny would lovingly make him meals too. Until three years ago, Granny attended daily mass here in this parish. She was well into her 88th year when she finally gave up her post as the Thursday Morning Mass reader. 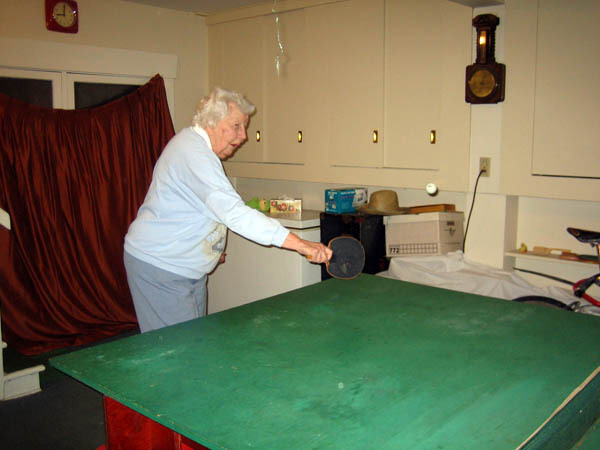 She was also a founding member of Saint Gerard’s Mission on Bowen Island. Granny’s faith guided every aspect of her life, from her love for her children, to her remarkable generosity and love for the poor. 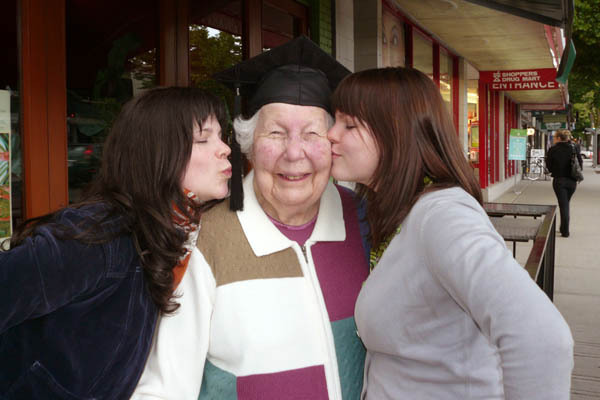 In her time as a mother, grandmother, and great-grandmother, Granny was the matriarch, the centre of our family. She was a very special person. When I think of Granny I think of her laughing from the deepest reaches of her diaphragm when retelling one of her favourite old jokes. “What did the ear wig say when it fell off the wall?” “Eeeaaaar we go!” I think of her love of poetry, and the way that from time to time, she would spontaneously erupt with a piece of poetry she’d memorized in her youth. I think of the way she’d catch flies, ants and spiders in her bare hands without flinching. I think of how excited and happy she got when a deer would wander into the garden at Bowen. I think of the way she used to sit in the sunroom, looking out over the ocean so peacefully, with a lovely calmness, a contentedness. I spoke to Granny on the phone from Nova Scotia the day before she passed away. I told her I’d seen a wild rabbit in the yard that morning; she said, “Just like I used to see when I was young.” I told her to reach out her arms because I was giving her a big hug, and she said “I’m imagining it now.” I told her I loved her, and I said “Goodbye my love.” And she said “Goodbye darling.” And it hit me that we were in two very different, yet similar, places. I looked out at the Atlantic Ocean, while Granny rested within view of the Pacific Ocean. Gran sounded peaceful, happy, calm. 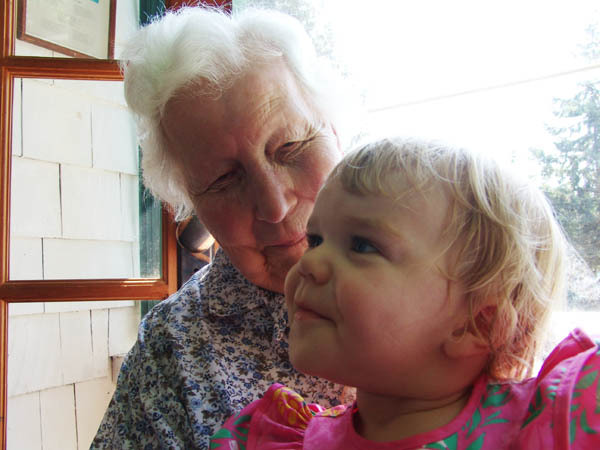 Gran was at the end of a life well lived, a life full of love and laughter, a beautiful life. And we, her family and friends, remain here, to honour her, to share our love for her, to remember a little girl named ‘Neta who climbed trees with her brother and mischievously snuck mulberries from the orchard; to remember a mother who raised 7 caring children, who grew into a graceful woman with permanent laugh lines, whose eyes spoke with the wisdom of age, whose smile showed true beauty, whose laugh spoke love. This entry was posted in Uncategorized and tagged Goodbyes, Granny.